March 13 marks the anniversary of Uncle Sam’s first American depiction, but in the beginning, he didn’t look much like a Fourth of July float or that famous “I Want You!” military recruitment poster. The first illustrated American Uncle Sam isn’t even the hero of his own cartoon. Here’s a look at our national personification, his strange history, and his even stranger family tree. 1. HE FIRST APPEARED IN AN EDITORIAL CARTOON CRITICAL OF THE UNITED STATES. On March 13, 1852, the New York Lantern published an editorial cartoon titled “Raising the Wind; or, Both Sides of the Story,” criticizing United States policies on shipping. Cartoonist Frank Bellew depicted John Bull, the anthropomorphized representation of Great Britain, pumping a bellows to help his ships sail across a small tub. Uncle Sam, a fellow with a big hat and striped pants, stood on the side and watched. This was the first time anyone in the U.S. had drawn Uncle Sam, although by some accounts there were earlier depictions in London's Punch, and the character was by no means Bellew’s creation. 2. THE NAME MIGHT GO BACK TO A MEAT PACKER. According to many sources, linking the young United States to the name “Uncle Sam” dates back to the War of 1812 (though some historians differ on the details). The most widely known version goes like this: The Americans were fighting the British at the Canadian border, and a Troy, New York, man named Samuel Wilson saw an opportunity for profit. He got in with the military delivering meat to them packed in barrels, which were labeled “U.S.” to indicate the seller. Wilson was widely liked and highly regarded among both the locals and the soldiers, who began joking that obviously the initials referred to his own name, rather than the government’s. The joke stuck, as did Wilson’s fame—his birthday, September 13, has been celebrated as Uncle Sam Day since 1989. 3. HE WASN’T THE FIRST FIGURE TO REPRESENT THE NEW COUNTRY. The figure of Brother Jonathan predates even the Revolutionary War, with possible connections to the Puritan Roundheads of the English Civil War. Early on, he was used to describe New England, and came to mean Yankees in general. George Washington was said to refer to Connecticut Governor Jonathan Trumbull by the name, though that story may be apocryphal. Loyalists to the crown also used the term dismissively to refer to Revolution-era patriots. By some accounts, Uncle Sam evolved out of Brother Jonathan, and the two figures were used interchangeably from the 1830s-1860s. 4. AT ONE POINT, AMERICA WAS A WOMAN. Before Uncle Sam or Brother Jonathan, it was Columbia who embodied the young nation. Inspired by classical Roman imagery and derived from the sailor Christopher Columbus’s name, she appeared throughout art, architecture, and media of the 18th and 19th centuries as a warrior, a guardian, and an innocent girl. She was the American Britannia, and “Hail, Columbia!” was an unofficial national anthem. The colonial black poet Phillis Wheatley even sent George Washington an inspirational poem about the figure. Columbia gave her name to the 1893 World’s Fair, widely known as the Columbian Exposition. Yet her popularity fell as Uncle Sam’s rose, and by World War I she was eclipsed by her sister: Lady Liberty. 5. A FAMOUS CARTOONIST GAVE HIM HIS BEARD. When it comes to creating iconography, cartoonist Thomas Nast was a giant in the American landscape of the Civil War and the later 19th century. He created the kindly, sentimental version of Santa Claus we recognize today, and devised (or by some accounts just popularized) the Democratic donkey and the Republican elephant to represent the two political parties. He was also famous for his cartoons of Abraham Lincoln, so it’s not surprising that certain elements of Lincoln made their way onto his versions of Uncle Sam, who became a little gaunter, a little older, and sprouted facial hair for the first time. 6. 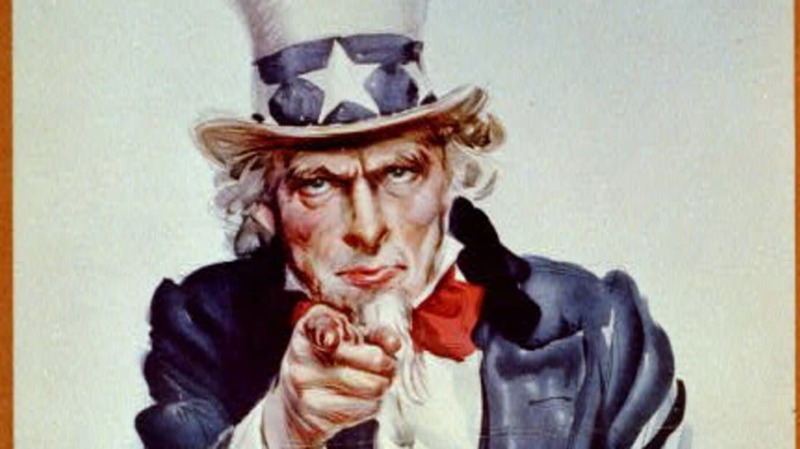 THE MOST FAMOUS IMAGE OF UNCLE SAM WAS FOR A RECRUITMENT POSTER. A war often means recruitment drives, and recruitment drives need art to bring in recruits. The most famous conception of Uncle Sam comes from artist James Montgomery Flagg, who created his first version of his iconic image for the cover of Leslie’s Weekly in 1916. The British had great success with a similar design using war hero Lord Kitchener to drive enlistment two years earlier, perhaps inspiring Flagg’s effort. Flagg’s painting graced 4 million posters between 1917 and 1918. He’d used himself as a visual reference for the first version, but when World War II rolled around, he enlisted an Indiana man named Walter Botts, who’d modeled for Norman Rockwell, to pose for an update. 7. THE “UNCLE SAM” NAME HAS BECOME ASSOCIATED WITH OTHER PATRIOTIC FIGURES. Before he was the 18th president, or even a Union leader, Ulysses Grant was born with a different first name: Hiram. When he was nominated to attend West Point as a teenager, however, his sponsor somehow copied his name as “Ulysses S. Grant” instead of “Hiram Ulysses Grant.” (Some say the s was a reference to his mother's family name, Simpson.) Once he arrived at the military academy, his classmates decided the “S” must stand for Sam, as in Uncle Sam, and it became his nickname even after graduation. 8. IT’S ALSO LINKED TO SOME COMIC BOOK HEROES. Remember Samuel Wilson, the possibly original Uncle Sam? That’s also the name of Marvel Comics’ first African-American superhero, the Falcon. However intentional or not that may have been, Marvel’s Sam Wilson is currently Captain America in print. It doesn’t get much more patriotic than that. 9. THE WILSONS ARE STILL KEEPING UP THE FAMILY NAME.